See, I'm a little too old to actually mail my Christmas Wishlist to Santa (Hey, I still make one, it just doesn't go to the North Pole). So I figured this year I would send my Christmas Wishes and Santa Cookies to someone a little more special. Jason Lansdon is my new found Santa. At the young age of 25 Jason is a Sergeant in the U.S. Marines, and is currently on his four tour in Iraq. This Christmas Jason will be away from his wife Jackie and his three month old baby girl Jayden. 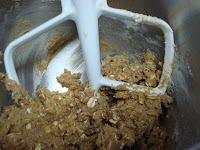 I was introduced to Jason when I joined the Baking Gals group. Baking Gals has teams of bakers, who bake for an individual, and their troop, who is serving our country. After reading through this round's teams, I was struck by Jason's introduction. Being that I am 24, I can't imagine having been to Iraq four times and to be away from my family at the Holidays. 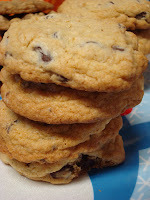 Jason's favorite cookie is Chocolate Chip, and I wasn't going to deny him of his favorite cookie. 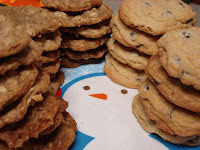 But, I figured some of the other bakers would also be sending chocolate chip cookies, so I wanted to make mine a little different. 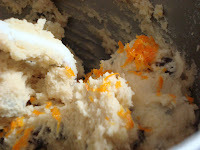 I added some grated orange zest and grand marnier to the batter. Why have I never done this before? I made myself a mini cookie and was in heaven at first bite. 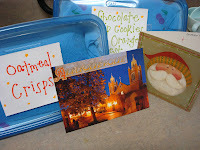 I also sent along some Oatmeal Crisps. Which are crunchy, mixed with a little bit of spice. A perfect holiday cookie. I am just so proud of all these men and women who are serving our country, and know that cookies could never say how grateful I am for their strength, bravery and selflessness. They truly are my heroes, and I will always be thankful to them for making sure that all of us here at home wake up every morning to a safe and free United States of America! My Christmas wish is to say Happy Holidays Sergeant Lansdon and Crew and may you have a safe and blessed New Year! You will be in my thoughts and prayers! I am completely touched by your kindness and your heart. 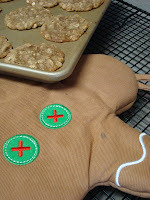 My husband Jason will love your cookies as well as his men. Thank you for taking the time to think of them. It is truely hard to be away from him this time of year but we are truely proud of him. Again, THANK YOU! Yummy cookies! Perfect in everytime. 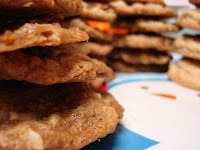 Cookie recipes are always welcomed! Thank you so much for sharing.